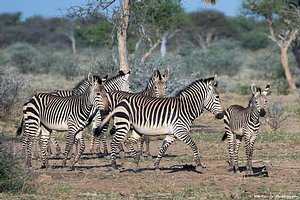 Namibia along the south west coast of Africa has it all - the animals. The gorgeous lanscape, the people and best value for your adventure. You won't be disappointed in the lodges, game drives, vistas and the kind and generous people. Etosha National Park has all the animals with exception of hippos and water buffalo. Animals to see are lions, rhinos, cheetahs, elephants, giraffes, birds, and leopards (if you are lucky). You might even have a story to tell when you get back like the Black Mamba snake that passed across my husbands feet in the washroom kraal one night at a bush dinner! At the start of my journey I stayed at the Otjiwa Safari Lodge - a great place to begin after leaving Windhoek. The sundowner game drive was so incredible in the abundance of wildlife we saw. Each lodge that I stayed in was one of a kind and just the best. Of course, a must visit is the Cheetah Conservation Fund, which is leading the world in cheetah conservation. I must do a whole section on this visit alone, with the remarkable work that is being done here. 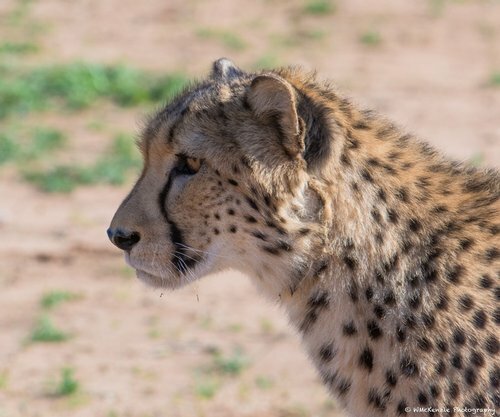 Namibia is now leading the way for conservation in Africa and the world with most of the remaining 7000 (only) endgangered Cheetahs in the wild. Each stay along the way in Namibia was memorable. I will never forget these giraffes as they wandered past our veranda, while drinking coffee in the morning or using the outdoor shower. Their game drives on their private reserve, outside Etosha National Park , were among the best and the bungalows are like an African dream. Waking up to the animals outside your room and the waterhole in front of the main lodge are everything you imagine to be your African adventure. The lodgings, night lit waterhole and hide, and their private game reserve was one of a kind. I really wish I had more time there. The birds and animals were amazing - especially the Black Rhino. 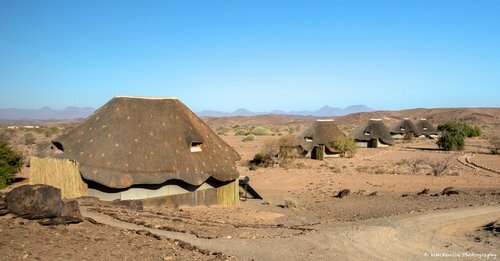 We also travelled to Damaraland - to a unique camp (luxury bungalows too), where we saw the Desert Adapted Elephants. I have to say that the people here made me cry with their joy for life and generosity. I was happy that the Camp (Wilderness Safaris) employed all local people. 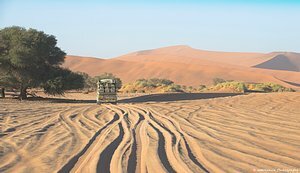 No visit is complete to Namibia without visiting the red dunes of Sossusvlei and Deadvlei. This landscape is a wonder to see. 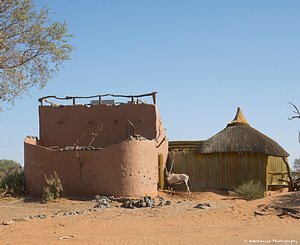 http://www.wilderness-safaris.com/camps/little-kulala Little Kulala Lodge is a jewel in the desert. I wish I could have stayed longer here as well. I wanted to sleep on the rooftop bed under the stars but never had a chance. I missed my opportunity to photograph the night sky but waking up at dawn to hike the sand dunes before the heat of the day tired me out. I hope you enjoy the photos from my adventure.